ang on a minute? Where’s the tremelo arm, the whammy bar? No, your eyes do not deceive, this is an Ibanez with a hardtail bridge. They’re not altogether unheard of, but they are certainly not the norm. 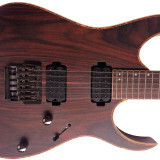 What definitely is the norm is that Ibanez produce fantastic instruments, especially for those who like to play fast. The Ibanez RG721RW-CNF (seriously Ibanez…these names are impossible to remember) is in the hugely popular RG range, with the coveted “Premium” label. Premium models get upgraded components and typically look and play like they’re worth a lot more cash than you need to pay. This model is so new that it isn’t even listed on the Ibanez site, only the Ibanez Japan site. My first impression of the RG721RW-CNF was the striking rosewood top. If you read somewhere that this top is actually “sonokeling”, that is just another word for Indian Rosewood. It looks fantastic, the way it blends with the fretboard, as if the top and neck was one single piece of wood. Add the charcoal chrome hardware and the effect is really appealing. Now the first thing that strikes me when I hold or play an Ibanez is the feel, and the standout “feel” aspect of this guitar is the weight. Weighing dead on 3kg (6.6 lbs)…it is feather light! It can be hard to get used at first, especially if you’re used to solid mahogany guitars which can be 30% heavier and more. 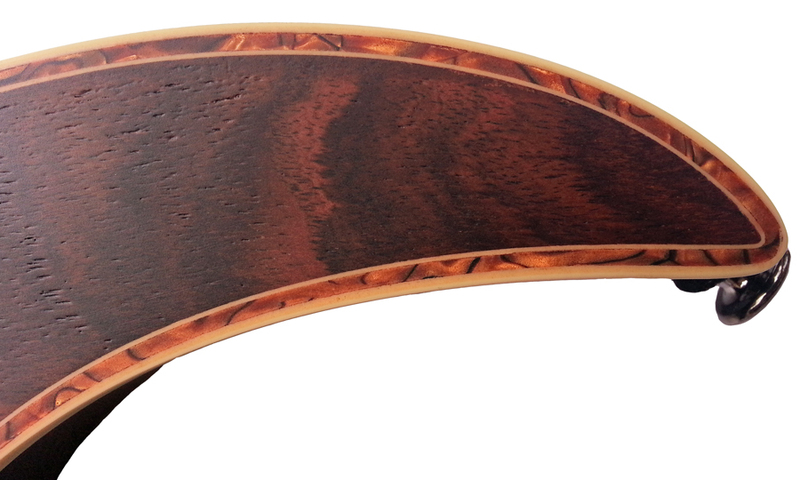 Those who have played a Wizard neck before will be familiar with the very thin and flat profile. For those who haven’t, this is an extremely thin neck. It is a 5 piece neck, maple and walnut. The thin dark stripes are the walnut & the effect of the multiple stripes looks fantastic. I also like the way the walnut stripes extend all the way through the headstock, a really nice touch. 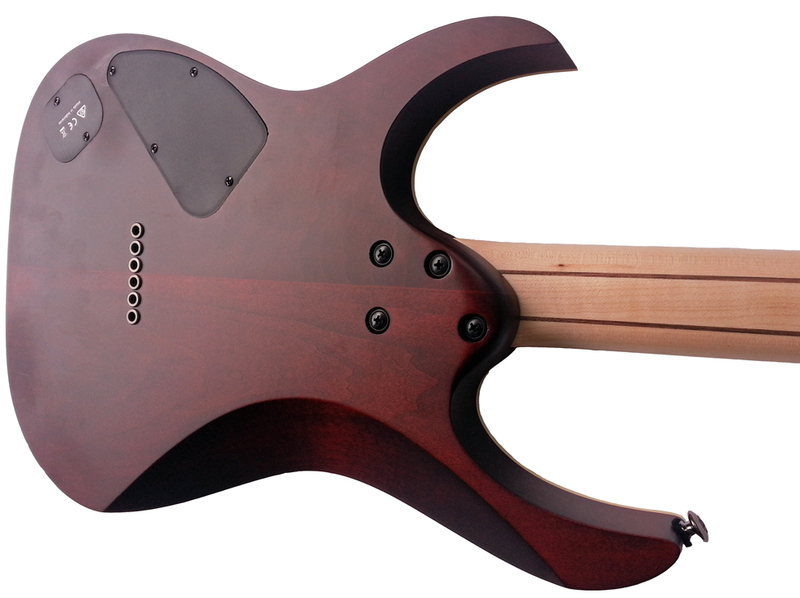 The neck is just 17mm (0.6 inches) thick at the first fret and only 20mm (0.7 inches) at the 12th fret. So it is not only thin, but consistently thin along the whole neck. The result is that you have comfortable access no matter where you are playing. The flat 430mm (17 inch) radius adds to the fast feel. I also really like the discrete dot inlays toward the top of the frets, however if you’re the type of player who uses fret markers to get your bearings, you may find the location and size of these markers hard to get used to. What I mean is, if you need to look down to locate the fret markers regularly as a guide, then these smaller offset dots don’t jump out like traditional inlays, especially when you’re looking down at the neck. I liked them, for a change, but it’s something to be aware of. 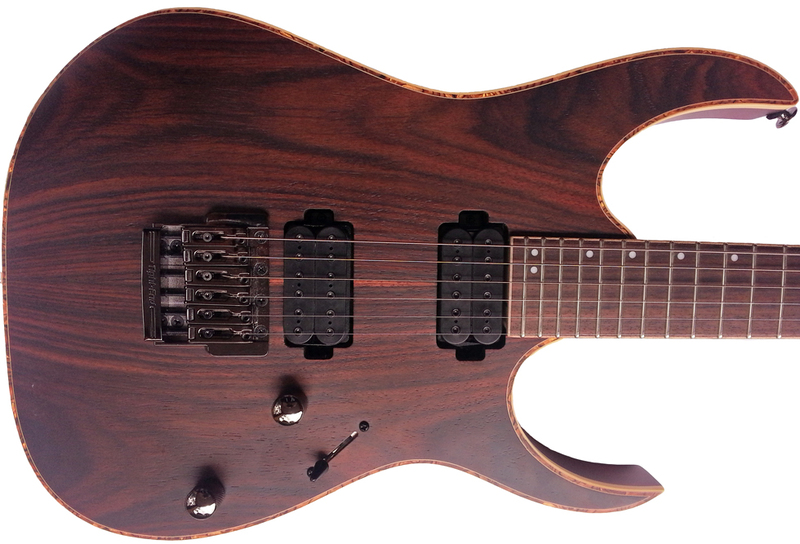 Ibanez have equipped the RG721RW-CNF with its visually unassuming CAP VM pickups which appear on some of the premium models throughout Europe. Details are scarce about the difference between the CAP VM 1 and CAP VM 2, but I’d suggest the bridge variant is wound to give a higher output. Overall I found that I could find excellent tones, however they are definitely stronger with distorted tones as opposed to cleans. Don’t get me wrong, the cleans are good, but I found them a little underwhelming and brittle. Through a tube gain channel, the tone is aggressive, but not over the top in power. Lead sounds were great, which is exactly what you want with such a fast and accessible neck. I think the combination of light weight basswood (a typically bright tone wood) and the rosewood top (a typically warm tone wood) results in a versatile output, but it definitely errs on the brighter side. In short, it’s a brighter sounding guitar. I found the straight up humbucker tones the most appealing (1 & 5), but depending on what you’re playing, the options available were surprisingly practical. 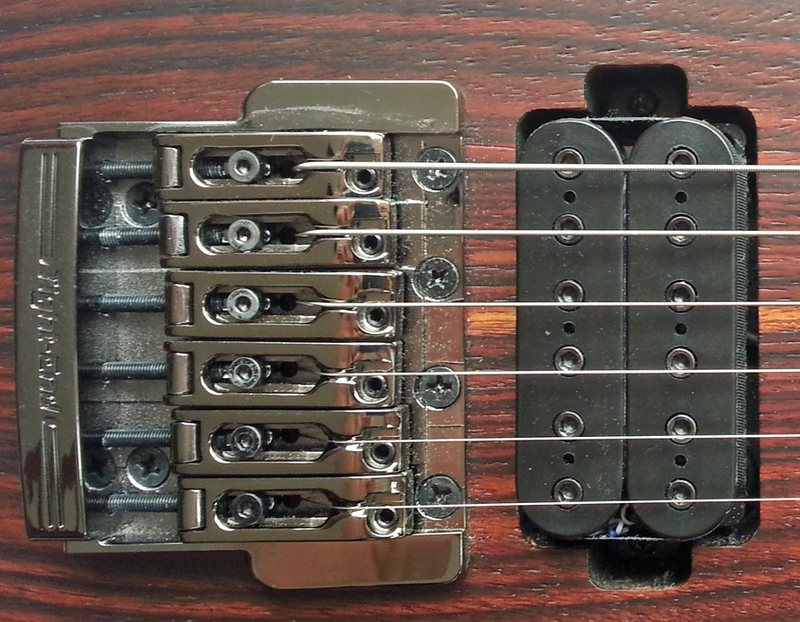 The Tight-End R bridge is an upgrade that deserves some attention. Ibanez say that by locking the saddles onto the base plate, string vibration is transmitted directly into the guitar body. This makes sense, but it’s hard to tell whether the resulting sustain is markedly improved with this setup. One thing I did like was that the top of the bridge is smooth and low profile, so there’s no annoying system of dials and arms getting in the way. As far as controls go, there’s just a single tone control and volume control, which I like for two reasons; 1) I think that its all this guitar needs, and 2) it looks great with just two dials on the body of the guitar. Being a Premium model, there are some nice touches which really catch the eye. 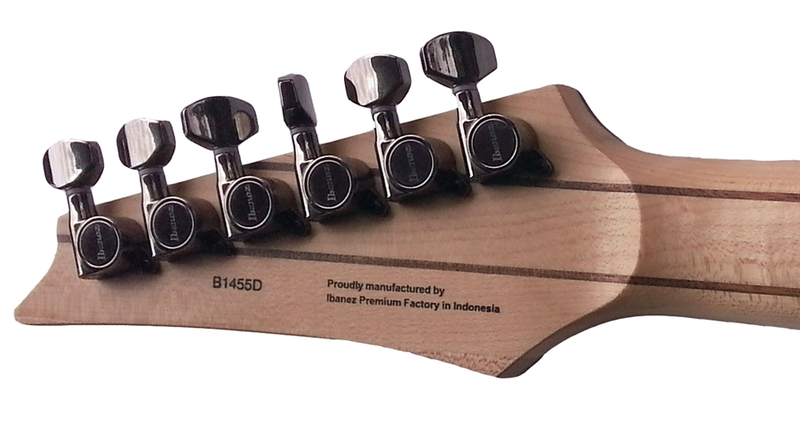 I’ve already mentioned the walnut stripes that extend up though the headstock, and the offset fret markers. This is on top of the unique Rosewood cap which gives the guitar it’s overall look. The other standout in build/design is the rather intricate binding. Images can be deceiving, so if you think the binding looks over the top, the effect in person is not like that at all. It adds a nice detail to the rosewood top and definitely highlights the look. The neck joint is nicely curved and fitted, not just a square bolted joint. The jumbo fret ends have also had the Premium treatment from Ibanez, they’re beautifully finished, so no nasty sharp or uneven edges (read my post on frets sizes to learn more about jumbo frets). The more I played the RG721RW-CNF, the more I came to appreciate all these little premium upgrades which when combined, make a big difference in just how easy this guitar is to play comfortably. The finish is called Charcoal Brown Flat. It’s not a very creative finish name, sure there is charcoal in the hardware, brown in the rosewood and its a flat finish as opposed to gloss…but what’s in a name? It looks fantastic. The flat finish not only looks terrific and highlights the grain of the rosewood, but some would argue that such a finish is better for the guitar’s tone. Premium highlights are the big drawcard for this guitar. The rosewood top and charcoal chrome hardware gives a natural distinctive look, whilst the super thin neck and light weight give this guitar an overall feeling of high tech wizardry. 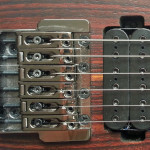 If I am to be critical, I felt that the pickups didn’t impress for clean tones as much as for a distorted tone. So if you’re looking for a premium unique guitar which is light, fast and delivers an aggressive gain tone without being overpowering, then the Ibanez RG721RW-CNF really delivers. The RG721RW-CNF isn’t easy to find. Click on the image below to find something similar and to help start your search.